As someone who still has much to learn about UX design and research I am always looking for reference books which will help me out. 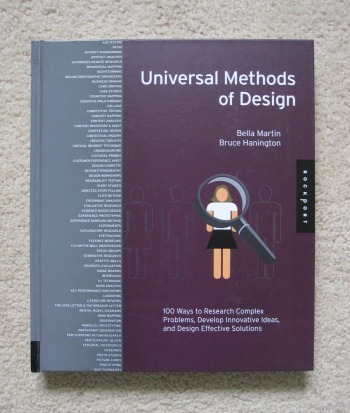 Universal Methods of Design by Bella Martin and Bruce Hanington is just one such book I was very glad to add to my collection. As it says on the cover it holds ’100 ways to research complex problems, develop innovative ideas, and design effective solutions’. It starts with a well designed content page that also shows which phase of the design process each method can be used for. It then launches into the methods, starting with A/B Testing and ending with Word Clouds while covering everything in-between, including Concept Mapping, Heuristic Evaluation and Role Playing. 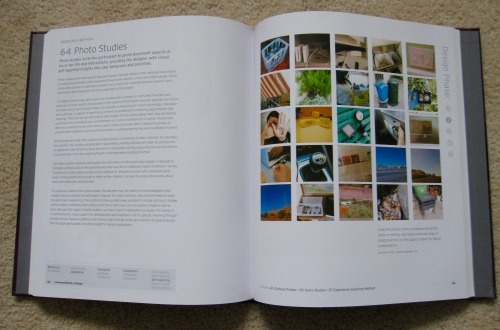 Each method is given a double page spread which gives information about the method, how to do it and relevant photos to back it all up. It is a really useful book and the one I am reliably informed has to be replaced from a large UX consultancy’s library most often. This is the sort of book it is really useful to keep on your desk for that moment where you are not sure what method to use in a certain situation, or when you have not used one for a while and need a refresher. It is also a hardback book so should stand up to my constant flicking. I would definitely recommend getting yourself a copy.